Now paralyzed from the waist down, a Valley firefighter talks about being crushed by an oak tree, his determination to walk again, and what's suddenly, the fight of his life. 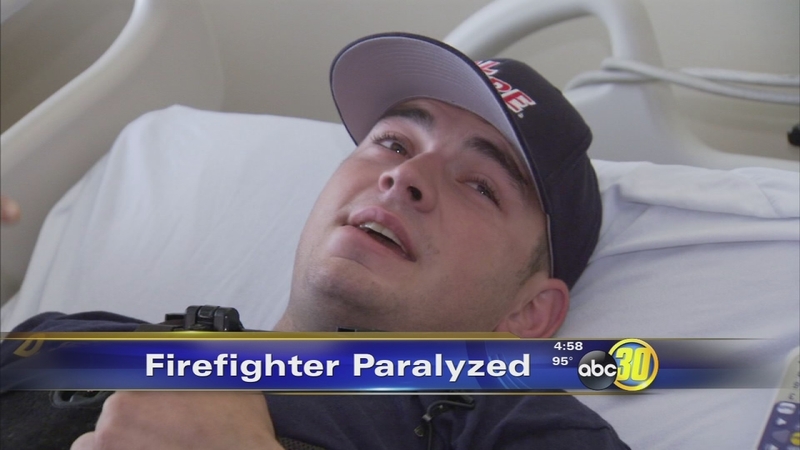 FRESNO, Calif. (KFSN) -- Now paralyzed from the waist down, a Valley firefighter talks about being crushed by an oak tree, his determination to walk again, and what's suddenly, the fight of his life. Pereira has been told by doctors, there is a 50/50 chance he will ever walk again. But he is focusing on the positive progress each day and the encouraging words from another Valley firefighter who endured very serious burns while fighting another fire. Pereira told ABC30, "I remember the tree hitting me on the head and then crushing me down like I was nothing." The 25-year-old never fully lost consciousness when he was struck by a huge oak tree while fighting a minor lightning fire on Case Mountain in Tulare County. "Everytime the tones go off, we know that this is a possibility that one of us may die," said Pereira. "And this situation was just a super rare situation." Other firefighters found the strength to lift the tree off him, but Pereira had already lost all use of his legs. From the waist down he is immobile. But still thankful for the ability to use his upper body. He added, "Luckily I know how to eat and I can use my hands and I know who everybody is so I'm extremely, I have a lot to be grateful for. Tuesday Fresno City Firefighter Pete Dern walked to his room for a brief visit. Dern is recovering from major burns he got during a fire several months ago. "I definitely look up to him," said Pereira. "He came in here and shook my hand. He had like him and all of his guys sign a Fresno city shirt and gave it to me." The visit not only inspired Pereira, it reminded him of the support firefighters offer to each other, when they are hurt or down. He explained, "He just looked at me and he said you are going to be ok, like you got this- stay strong, everything is going to be ok."
Pereira lives on the central coast but works in Tulare County. His wife has been by his side nonstop and helping her husband through difficult moments, and painful sleepless nights. Within the next few weeks, Pereira is expected to be transferred to a rehab facility in Northridge.